Glass shower enclosures from NEI Glass are a great way to breathe new life into your bathroom. We can create a glass shower enclosure to fit into almost any space, no matter how large or small! Plus, NEI Glass offers a wide variety of glass colors and textures as well as trim and hardware options to make your new glass shower enclosure that much more unique. Our most popular style of glass shower enclosure is our frameless enclosure (often referred to as a European style shower). The frameless glass shower enclosure is just as the name implies— frameless. The panes of glass that make up the enclosure are fixed to each other and do not require the added strength provided by a metal frame. Click here to learn more about frameless showers. NEI Glass offers more than new glass shower enclosures. 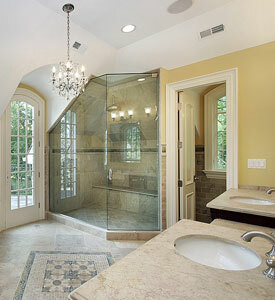 We can also repair your existing shower enclosure or provide options for upgrading the glass and shower door hardware. Shower door hardware upgrade options are only limited by the existing holes in your shower door glass. As there is no way to replace the glass in the existing holes in your shower door and enclosure, we will have to find new hardware that matches the original. Most of the new glass shower enclosures installed by NEI Glass are frameless but that does not mean there is no longer a place for framed shower enclosures. Frameless shower enclosures are very flexible. Without a metal frame to consider, frameless shower enclosures can take on a variety of sizes and shapes, including curves! There are some cases, however, where a certain pattern or texture of glass may not be available in the thickness needed for a seamless shower enclosure. Also, for customers who do not want a minimalist or modern designed bathroom, a framed shower enclosure may be a perfect fit.